RSS-BJP’s relationship with the Indian Constitution has changed over the years. Rahul Gandhi said this week that the final motive of the BJP is ‘to destroy the Constitution of India’. But the RSS and the BJP’s relationship with the Indian Constitution is far more complicated than this simplistic election season rhetoric. Prime Minister Narendra Modi and RSS’ Mohan Bhagwat have repeatedly pledged complete commitment and devotion to the founding document. But the RSS had once categorically rejected it as an anti-national document. Here is how the trajectory of the RSS-BJP’s relationship with the Constitution has progressed over the decades: criticism, review, freeze, appropriate, worship. The RSS was very critical of the symbols of the newly created Republic of India in 1947-48 period. It opposed the name Bharat and instead preferred Hindusthan; it remained unconvinced about the tricolour flag; and it did not find anything ‘national’ in the Constitution. The RSS’ unease with the Constitution can also be found in the documents of the Bharatiya Jana Sangh (political predecessor of the BJP, formed in 1951 by RSS activists). Its 1951 manifesto clearly said that the Jana Sangh is committed to establish a ‘Dharam rajya based on Rule of law’ for the revival of Bharatiya culture and revitalization of true Bharatiya nationalism’ (Bharatiya Jan Sangh—Party Documents, Vol. 1 BJS publication, New Delhi, P 49). Although the Bharatiya Jana Sangh (BJS) began to appreciate a few constitutional ideals in later years, the party found the idea of constitutional federalism deeply disturbing. The BJS drew inspirations from the RSS’s stated critique of the Constitution, which was articulated systematically by M.S. Golwalkar in the 1960s. Golwalkar rejected the Constitution on three counts. First, he believed that ‘the framers of the Constitutions were not firmly rooted in the conviction of a single homogeneous nationhood’ and therefore they couldn’t think of a unitary form of the government (Bunch of Thoughts, P 174). Second, the ‘mind and reason of the leaders were conditioned by the obsession of federation of states’ and it prevented them to realise the political and cultural oneness of India (Bunch of Thoughts, P 179). Third, he argued that the Constitution ‘has absolutely nothing, which can be called our own’ (Bunch of Thoughts, P188). This critique of constitutional federalism is also recognised as one of the core principles by the BJS (Bharatiya Jan Sangh—Party Documents, Vol. 1 BJS publication, New Delhi, P 17). It was only in the 1980s that the BJP began to support the idea of balanced federalism. The Sangh Parivar’s attitude towards the Constitution changed somewhat in the 1990s. The BJP, an established opposition party by then, did not use the rhetoric of the Hindu Rashtra or pseudo- secularism but demanded a comprehensive review of the working of the Constitution. In the 1999 manifesto, it stated that the party ‘shall appoint a Commission to review the Constitution… in the light of experiences and developments … of the entire post-Independence period’. This led to the formation of the National Commission to review the working of the Constitution (NCRWC), also known as Justice Venkatachaliah Commission. The NCRWC submitted its detailed technical report in 2003, which somehow went against the spirit of the Hindutva critique. The BJP found the report politically useless and ignored it completely in later years. However, in the 2010s, the BJP started using the Constitution as a political symbol in order to defend itself against the critique of its ideology. Narendra Modi as the PM candidate of the BJP began his election campaign with a bold declaration that Constitution is a ‘holy book’ and the only code of conduct of the government should be ‘Sabka Saath, Sabka Vikas’. This newly found fascination for the Constitution as a ‘sacred doctrine’ continued even after the impressive electoral victory. 26 November, the day when the Constituent Assembly adopted the final draft of the Constitution in 1949, was declared as the Samvidhan Divas by Modi government in October 2015. In a speech dedicated to the greatness of the Constitution, Modi went on to say that ‘if there is any creation made by man which is immortal, it’s India’s Constitution’. 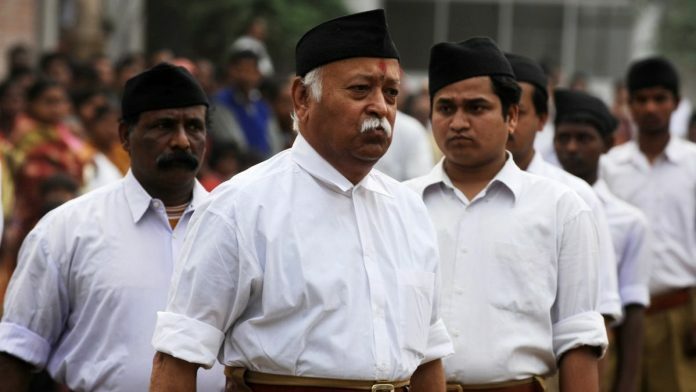 Bhagwat also reiterated the RSS’s loyalty and devotion for the Indian Constitution at least 78 times in these lectures. He did not even hesitate to disown Golwalkar’s famous text Bunch of Thoughts to justify RSS’s dedication for the Constitution. He said that the RSS thinking had changed and the Bunch of Thoughts did not represent the contemporary moment of Sangh’s politics. Review it, freeze it, appropriate it or worship it? The Sangh Parivar does not want to disown the Constitution at all in the name of Hindu Rashtra. Nor do they want to review it. They simply want to freeze it as a dead entity so that it can be transformed into an object of forced worship. This is exactly what Nehru warned us against in 1948: “While we want this Constitution to be as solid and as permanent… nevertheless, if you make anything rigid and permanent, you stop the nation’s growth, the growth of a living, vital, organic people.” (Constituent Assembly Debates Vol. 7 p. 322). ThePrint is publishing three series on minorities in India by Hilal Ahmed. The ‘Sarkari Muslim’, ‘Minority Report’, and ‘Line of Law’ will trace the political journey of Muslims in the country. This is the first article under Line of Law. Not quite freeze it, as a dead entity. When required, it can be put in the microwave for a quick thaw, amended in 48 hours.